Includes two rare components- royal jelly and sesamin- which help to keep you feeling youthful and energetic. Especially recommended for women in their 40's and above. Vitality from royal jelly and youthfulness from sesamin in one pill! Many of us start thinking about ways to maintain our vitality and youthfulness when we approach our 40s. That is so why many consider Suntory Royal Jelly to be one of the best supplements for boosting energy and youthfulness. Royal jelly is nutrient-dense honey that created by bees to provide their queen with all the nutrition she needs. Rare sesamin, which you can normally only find in sesame seeds, has incredible anti-aging benefits. Theses two potent ingredients are packed into Suntory Royal Jelly + Sesamin tablets to boost health, vitality, and beauty. There are more than 40 nutrients in royal jelly that sustain the powerful queen bee. As the queen bees of the human world, we can benefit from this miracle honey too! Try this anti-aging remedy and see the benefits for yourself: smoother, more radiant looking skin, great health, and youthful energy! Take 4 tablets per day with water. Cautions: Do not take more than the daily recommended amount. Not suitable for those with asthma. 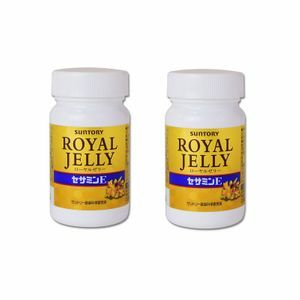 Looking for the best deals for SUNTORY Royal Jelly and Sesamin supplements?